Recorded weeks before the world would be transfixed by the marriage of Charles and Diana (who gets a lovely little shout-out on “Ballroom Blitz”), Mindless, Directionless, Energy (and, yes, that second comma always irks me) is a timely reminder that not all of England was atwitter over Di’s dress and the fabricated fairytale. 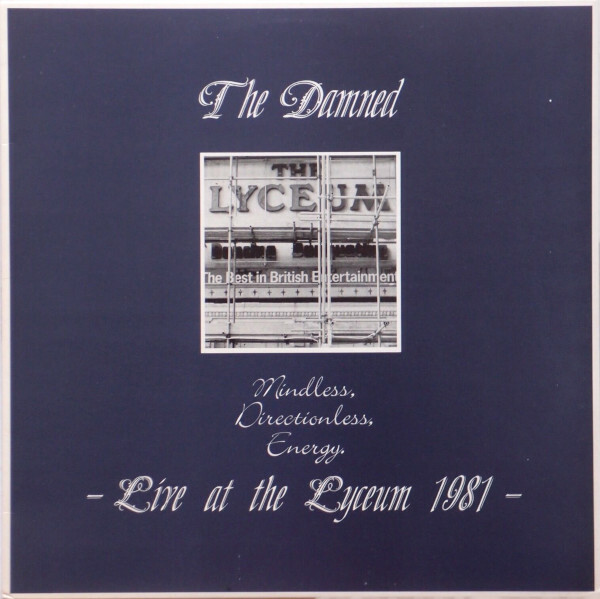 More importantly, though, it’s a welcome reminder that The Damned was still a surging, scathing punk band—something you might have missed after listening to The Black Album. Now, a word of caution about the recording quality: crap. It’s probably a soundboard recording, the bass and the drums are loud, the guitars and the vocals are muffled, the only crowd noise that filters in is likely whatever came through Dave Vanian’s microphone. Anyone who complains about Rat Scabies’ drums being too loud, however, deserves to have their punk membership card torn up. The man is an absolute fiend, Paul Gray matches him stride for stride, and the contributions from Vanian and Captain Sensible that bleed through are delicious. As for playful banter, there’s hardly any (save the tasteful dedication to Lady Di). Vanian introduces the song’s title (he might have checked the record sleeve of their first album first) with a ghoulish leer and gets on with it, tearing through a good chunk of Machine Gun Etiquette and some old favorites (“New Rose,” “Looking At You,” “I Feel Alright”). Tellingly, the only track featured here from The Black Album is arguably its heaviest, “Drinking About My Baby.” The result is a great throwback of a concert that excises all that gothic unpleasantness and synthesizer nonsense from the last record. More than a few Damned concert discs exist, and I honestly can’t say for now where this fits in with the rest. You can buy this on compact disc (and get “New Rose” for your troubles), but I suspect you’ll feel a little foolish listening to something this sonically challenged on a cd. Despite its muddy sound, the band clearly still packed a helluva punch on stage in 1981. You may also want to check out Live at Shepperton 1980, which features the same lineup and many of the same songs. *Elpee misspells Rat Scabies’ real name as Miller instead of Millar. **This is a cover of The Stooges’ song “1970 (I Feel Alright)” and not the Jimmy James & The Vagabonds song. Paul Gray (bass), Rat Scabies (drums), Captain Sensible (guitar), Dave Vanian (vocals). Produced by Daniel Belasco; recording engineered by Mick McKenna; re-mix engineered by John Gibbons. Released on elpee and expanded compact disc in 1987 in the UK and France (ID, NOSE/CDOSE 18) with picture innersleeve. Elpee and compact disc feature different covers. Re-issued on expanded compact disc and cassette in 1990 in the US and Canada (Restless, 72384-2/4) with one bonus track and unique cover.